The Environmental Protection and Regional Development Ministry (VARAM) has worked out a new administrative-territorial map of Latvia, cutting the number of local governments to 35 from 119, according to information obtained by LETA. The municipalities of Liepaja and Madona would have the largest territories, according to the draft proposal. Riga, Daugavpils and Liepaja would be the largest municipalities by the size of population with more than 100,000 residents in each of them. Livani would be the smallest municipality with a population slightly below 12,000. 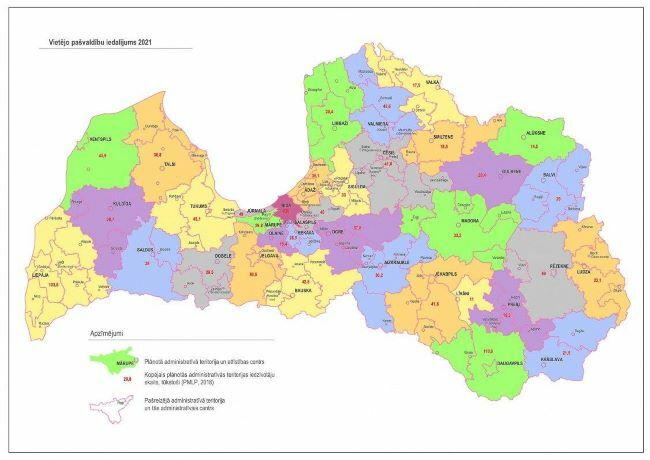 According to the draft map, a number of municipalities in Riga Region would be merged. For instance, Adazi would be merged with Carnikava and Kekava with Baldone. Environmental Protection and Regional Development Minister Juris Puce (For Development/For) said in an interview with Latvian Television on Tuesday night that the number of local governments would be reduced from 119 to 35. He argued for his reform plan saying that the creation of larger regions would to promote regional development, especially where economically weaker regions will be merged with stronger ones. “I suppose many will find the map somehow familiar, as it will largely resemble the map that was used before the launch of the [previous] regional reform,” the minister said. The ministry will now send the draft territorial map to local governments and other parties concerned for debating. As reported, on March 21 Saeima approved the Environmental Protection and Regional Development Ministry’s draft resolution on launching an administrative-territorial reform. According to the draft resolution, the new territorial reform would continue the reform started in 1998. The goal would be to complete the reform by 2021, creating administrative territories with a development potential and properly functioning local governments that would be providing high-quality services to residents for adequate costs.